Get ready to party like its 2016. Update Jan. 4, 2018: Attorney general Jeff Sessions is expected to announce today that he will rescind the Obama-era policy that let legalized pot flourish. While campaigning for US president, Donald Trump said marijuana legalization should “be up to the states.” But, in an about-face from the campaign trail, the Trump administration now appears to be planning to shut down legal recreational use. Describing medical and recreational marijuana as “two distinct issues,” Spicer said the president “understands the pain and suffering that many people go through” who are facing terminal disease, and the “comfort” medical marijuana can bring them. But there’s “a big difference between that and recreational marijuana,” he said. “You see the opioid addiction crisis blossoming, the last thing we should be doing is encouraging” marijuana use, he said. How the discrepancy between state and federal law will be handled is “a question for the Department of Justice, but I do believe you’ll see greater enforcement” of federal laws, Spicer said. It is now legal to use marijuana for medical purposes in 30 US states—that number grew significantly in the last election—and legal to use it recreationally (rather than for medical reasons) in eight: Alaska, California, Colorado, Maine, Massachusetts, Nevada, Oregon, and Washington. Other recent research suggests that cannabidiol, the non-psychoactive element in marijuana, can actually treat opioid addiction, and some experts believe it could lessen the opioid crisis dramatically. Any plans to roll back states’ rights on marijuana would face a stiff battle from voters and from local lawmakers, because of the revenue legalization has brought in, and promises to bring in down the road. Last year, the Marijuana Policy Group published a report (pdf) crediting legal weed in Colorado with adding about $2.4 billion to the state’s economy in 2015. 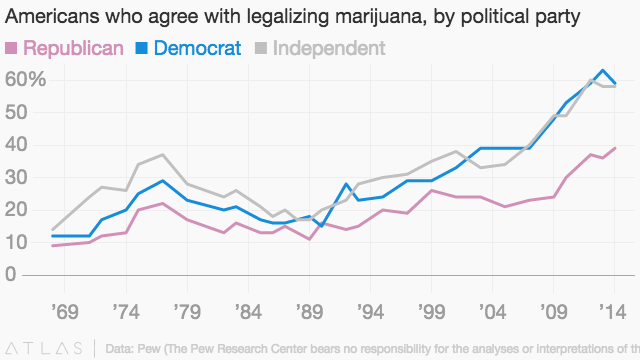 Legalization has growing, and broad support in the US, although less from Republicans.